GoPro Hero Frame w Hot Shoe Mount #3DPrinting #3DThursday « Adafruit Industries – Makers, hackers, artists, designers and engineers! barspin shared this project on Thingiverse! ONLY FOR STATIC USE. IF MOUNTED ON HELMET, BIKE ETC AND THE FRAME OPENS, YOU WILL LOSE YOUR GOPRO. USE AT OWN RISK. 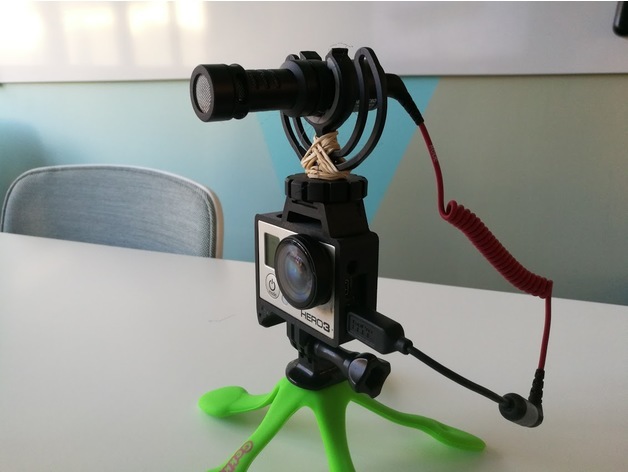 This is based on the “Quick Release GoPro Hero Frame” (https://www.thingiverse.com/thing:2193900) but with a hot shoe mount added on top for a microphone or light. This is a 3Dprinted frame i use with my GoPro Hero3. It can easily be opened and closed using a simple snap lock design. It needs to be printed in a somewhat flexible for the concept to work I have printed it in nGen from colorFabb which works and a pre-release PetG from Proto-Pasta. If you successfully print one in other materials let me know. See full project and video here!